I attended the HRWM group meeting for the first time in Mallorca, Spain in 1996. Since then, the HRWM group has continued to be the most productive and interesting platform in my research carrier, especially through its series of symposia. In recent decades there have been so many advances within the HRWM study area, including molecular techniques, QMRA, microbial source tracking, etc. I am excited that we are now at a stage in this era where the outcomes of those developments are gradually being implemented into real societies. I contributed to the International Symposium on HRWM (WaterMicro 2007) in Tokyo as a member of the local organizing committee, and served as the HRWM group secretary from 2009 to 2013. Now, I am more than happy for the opportunity to contribute to the group further as its vice chair. I would like to maintain the traditional virtues of our group while attracting young members and enhancing international diversity. Gary A. Toranzos-Soria, a native of Cochabamba, Bolivia earned his Ph.D. at the University of Arizona in 1985 in Environmental Virology. After a post-doctoral position at the University of Florida, he relocat-ed to the University of Puerto Rico, Rio Piedras Campus where continues to conduct research in environmental microbiology. He is a Fellow of the American Association for the Advancement in Science and the American Academy of Microbiology. Toranzos Soria has served the Health-Related Water Microbiology as a member and board member for over 20 and 10 years respectively. Regina Sommer is Associate Professor at the Medical University Vienna, Austria (Institute for Hygiene and Applied Immunology). She is head of the unit Water Hygiene where she is teaching, researching and running the accredited Laboratory and Inspection Body “Hygiene Vienna” (authorized by the Ministry of Health). Together with Prof. Andreas Farnleitner she serves as co-head of the Interuniversity Cooperation Centre ICC Water & Health in Vienna (www.waterandhealth.at). Regina is convenor of the Austrian drinking water commission and member of the Advisory Board for Bathing Water Hygiene of the Ministry of Health in Austria as well as of the Water Microbiological Advisory Board of the EU Commission. Together with the Georg Hirschmann (Austrian Institute of Technology), Alexander Cabaj and Alois Schmalwieser (Department of Medical Physics, Veterinary University Vienna) and Thomas Haider (HAI-SO) Regina founded the “UV Team Austria” and the Water Test Centre Wiental with a Test Facility for UV disinfection systems (www.uv-team-austria). Regina has studied Food- and Biotechnology at the University of Natural Resources and Applied Life Sciences, Vienna, and did her PhD at the University Vienna. In 1999 she received the Venia docendi and was appointed as Associate Professor in 2000. “The members of the IWA SG Health Related Water Microbiology supported and inspired me since I was a young scientist. Serving for our group enables me to give back some of the positive experiences, which I have gained”, Regina says. Daisuke Sano earned Ph.D. at Tohoku University, Japan in 2003, under the supervision of Prof. Tatsuo Omura, and then spent 6 years in Tohoku University and University of Barcelona as a post-doctoral research fellow. In University of Barcelona, he joined the laboratory of Prof. Albert Bosch, and was involved in multiple projects with regards to culture-independent evaluation of virus infectivity and genotyping of human noroviruses and sapoviruses in environmental water. Now Dr. Sano has been managing a team of water and public health study in Tohoku University, where he is responsible for the research and supervision of international and domestic projects in the field of public health microbiology and sanitary engineering. Rosina Girones is professor of Microbiology at the University of Barcelona, Spain, specialized in viruses. Dr Girones was a postdoctoral researcher at the Hepatitis Viruses Section, Laboratory of Infectious Diseases, NIH, USA and has been invited researcher in laboratories in Sweden and USA. Rosina Girones has been the Head of the Microbiology Department of the University of Barcelona and is, at the present, Coordinator of the Section of Microbiology, Virology and Biotechnology in the UB and team leader of the Laboratory of Viruses Contaminants of Water and Food (Vircont). The main area of interest is the study of classical and emerging viral pathogens and the development of new viral indicators and MST tools. Dr Girones is at the present working on the improvement and control of the microbiological quality of recycled water, irrigation water, food and superficial and ground water. Celia Regina Monte Barardi got her Ph.D. in Biological Sciences (Molecular Biology) at the Federal University of São Paulo (UNIFESP). She is Full Professor of the Microbiology, Immunology and Parasitology Department at Federal University of Santa Catarina (UFSC), where she teaches Immunology and Virology and also at Biotechnology and Biosciences post graduation program at UFSC. She is a research productivity fellow at CNPq. She had two post-doctoral internships experiences abroad: Mcquarie University, Sydney, Australia and University of Barcelona, ​​both in ​​Environmental Virology. She was vice-president of the Brazilian Society of Virology at the bienium 2014-2016. In September 2015, during the 18th WaterMicro held in Lisbon, she was indicated by her international scientific peers to compose the scientific board of the group Health Related Water Microbiology affiliated to the International Water Association (IWA) at the 2015-2019 quadrennium. Her projects are focused on Environmental Microbiology, with emphasis on Virology studying contamination of water, sediment and bivalve molluscs aiming disinfection and/or reuse. Maronel holds a M. Tech degree in Environmental Health and has been employed at the Council for Scientific and Industrial Research (CSIR) in South Africa since 2005. She has more than 13 years’ research experience in water and health-related projects. Her experience includes health risk assessments (both chemical & microbiological human health risk assessments), environmental epidemiology, drinking water treatment, waste-water reuse, and water pollution microbiology, health economics, Burden of Disease and guideline development. Maronel has been involved in projects funded by various national and international organisations (e.g., DWS, Copper Development Association of South Africa, Agricultural Research Council, City of Cape Town, WRC, USAID, AU (e.g., ACT4SSAWS) and the EU (e.g., RECLAIM, LIVEDIVERSE)). Some of her recently acquired skills are tissue culture, toxicity assessments and genetic impacts of human cell lines exposed to pollutants (e.g., crude oil, acid mine drainage) which currently also forms part of her PhD studies. Maronel has been a member of both the Water Institute of Southern Africa (WISA) and International Water Association (IWA) for more than ten years. She currently also serves on the management committee for the IWA Specialist Group: Metals and Related Substances in Drinking Water. Dr. Ko is the director at Center for Human and Environmental Microbiome, and professor at Seoul National University. Dr. Ko received Ph.D. degree from Harvard University, and did post-doctoral training at the University of North Carolina at Chapel Hill. He was a faculty at University of Texas HSC at Houston prior to joining to Seoul National University in 2005. His research has been focused on critical contemporary research needs in enteric viruses and microbiome. He is currently working as a director of the norovirus related projects, so called NOROTECL, which is funded by Korean FDA. In this project, he and his colleagues are 1) to perform the surveillance and microbial source tracking of norovirus in sea and surface water, 2) develop novel diagnosis and control techniques, and 3) development of small animal models for human norovirus. Dr. Ko’s group developed and identified the microbiological molecular markers through high through sequencing techniques and other novel techniques. The success of his research accomplishments is reflected in his record of scholarly publications in the peer-reviewed scientific literature, with more than 100 peer-reviewed articles. Dr. Meschke is a Professor in the Department of Environmental and Occupational Health Sciences and Adjunct Professor in the Department of Civil and Environmental Engineering at the University of Washington. Dr. Meschke is an environmental and occupational health microbiologist by training, specializing in the fate, transport, detection, and control of pathogens in environmental media (Air, Water, Food, and Surfaces). His research interests include development of methods for environmental surveillance of Poliovirus and other enteric viruses, prevalence of antimicrobial resistant bacteria, and quantitative microbial risk assessment. Ricardo Santos did his PhD at Queens University Belfast in Environmental biodiversity and stress microbial mechanisms. Currently working in Instituto Superior Técnico, Laboratório de Analises he is leading a team of the Water Microbiology Department. In recent years his research interests include Microbial Source Tracking, Foodborne Pathogens namely Viruses and protozoa, Environmental Microbiology, Microbial Stress resistance and environmental biodiversity in extreme environments. Kwanrawee (Joy) Sirikanchana is a senior scientist 1 at the Chulabhorn Research Institute (CRI). She received her Bachalor’s degree from the Department of Environmental Engineering, Chulalongkorn University, with first-class honors. Dr. Sirikanchana completed her Master’s and Ph.D. degrees at the Department of Civil and Environmental Engineering, University of Illinois at Urbana-Champaign, USA, focusing her work on bacterial and viral disinfection in drinking water. Her outstanding dissertation later won the prize in the Thailand Thesis Award, given by the National Research Council of Thailand. Dr. Sirikanchana received her postdoctoral training from the University of California, Davis, where she focused on microbial source tracking using molecular methods. Currently, Dr. Sirikanchana is conducting research and advising graduate students at the CRI, focusing on waterborne pathogens and microbial source tracking using culture and molecular techniques. She was awarded the New Face in Civil Engineering from the American Society of Civil Engineers in 2009, the IWA-HRWM Willie Grabow Young Investigator Award in 2015, the Young Alumnus Achievement Award from the University of Illinois at Urbana-Champaign in 2016, and the Kurita Water and Environmental Foundation (KWEF) – Asian Institute of Technology Research Award in 2016. She also serves as an Associate Editor of the Thai Environmental Engineering Journal. Susan Petterson is the director of Water & Health Pty Ltd, and an Associate Professor in the School of Medicine at Griffith University, Australia. Susan serves as an editor for the Journal of Water and Health (IWA Publishing), and is a member of the Water Quality Advisory Committee (WQAC) responsible for the rolling revision of the Australian Drinking Water Guidelines. Susan is an environmental engineer with a particular interest in Quantitative Microbial Risk Assessment (QMRA) and the interpretation of environmental microbiological data to support evidence based public health. I am full professor at the Karl Landsteiner University for Health Sciences and head of the Interuniversity Cooperation Centre for Water & Health (ICC Water & Health) at the TU Wien (www.waterandhealth.at). My research interests are in the field of faecal pollution diagnostics and management (e.g. detection of faecal pollution, microbial source tracking, and health risk assessment of pathogens) and the microbial ecology of ground- and drinking water resources. I am also editor for Water Science & Technology and the Global Water Pathogen Project (GWPP). For me, the HWRM specialist group is the most important authority in the field of microbial water quality and health and I am happy to serve these activities as a board member. 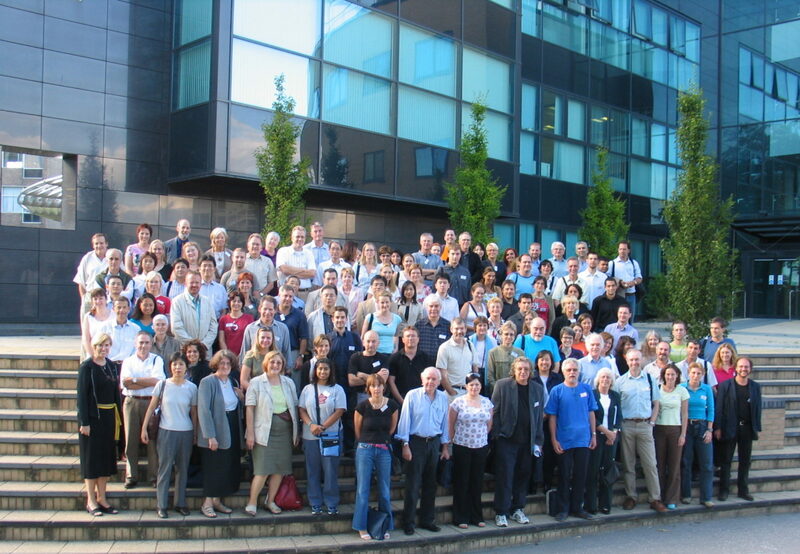 My first conference of the HRWM group was in Swansea, Wales, UK in 2005.